The planned prosecution of Supreme Court judges who acquitted 11 peasant farmers jailed over the death of police officers during a violent land eviction in 2012, known as the Curuguaty Massacre”, could undermine the rule of law, a UN expert said on Monday. “These are fundamental elements in the full enjoyment of human rights,” UN Special Rapporteur on independence of judges and lawyers, Diego García-Sayán, said in a press release. “It is the obligation of the State to ensure judges be allowed to decide the case before them impartially,” he added. In June 2012, according to news reports, more than 300 police officers took part in an operation to remove a group of farmers and their families who were living on State-owned land in Paraguay’s Curuguaty district. The eviction order was reportedly issued after a prosperous family, who said they had been gifted the land by former dictator, Alfredo Stroessner, alleged that the “campesinos”, or peasant farmers, were in fact living on private property. Media reports said that 18 campesinos were convicted on murder charges, while no police officers stood trial for the farmers’ deaths. The massacre occurred at a time of political change, with the election of Paraguay’s first progressive president in 60 years. In July, Paraguay Supreme Court Justices acquitted 11 people, and ordered the release of four campesinos who remained imprisoned, after judges agreed the trial failed to prove them guilty of the crimes for which they were charged. The 2012 trial was reportedly marred with irregularities, including allegations of violations of due process and the right to defense. In August this year, the Prosecutor-General filed a case against the three judges who acquitted the campesinos: Cristóbal Sánchez, Arnaldo Martínez Prieto and Emiliano Rolón Fernández. The entire investigation process has caused uproar, ignited local human rights protests, and brought the country’s long history of unfair land distribution and peasant prosecution to the surface once more. A 2018 World Bank census shows that more than 70 percent of land in Paraguay is occupied by just one percent of farm businesses, making it the country with the highest level of land inequality in the world. 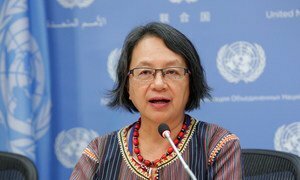 The United Nations Special Rapporteur on the rights of indigenous peoples identified a number of ongoing challenges remaining in Paraguay as she ended an eight-day official visit to the country on Friday.